To obtain various sound effects, edit, control or polish your sound, you will need to use plugins. 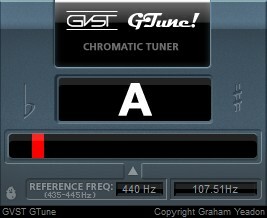 There are several plugin file formats, the most common on PC being the VST format, invented and standardized by Steinberg (the publisher of Cubase). There is a multitude of effects, from non specialized to highly specialized ones. Here's an overlook at some of them. Compression allows you to boost the sound. Its purpose is to reduce or make denser the dynamics of a sound. Dynamics is the difference between the lowest and the highest level of a sound. For instance, when you watch a film on television, whether the actor is murmuring or talking normally, you will hear more or less the same volume: the sound was compressed in order to avoid big differences between the weakest and the loudest sounds. Compression should be used with some moderation in order to avoid unpleasant side effects: a sound that is too compressed will seem to be "pumping", because the compressor will be permanently compensating the differences in volume of the signal. Some instruments are easier to compress thant other and compression will be used differently, depending on the expected result or the musical genre. Compression will be used much more in Dance music that in Classical music. In the latter, it is common to hear very soft and quiet passages, abruptly alternating with violent passages, which creates striking contrasts. In modern music, compressed sounds (when done right) sound more flattering to the ear. The purpose of compression is also to make your song sound as loud as other songs, which leads to various degrees af abuse, harmful for the music... and your ears. Classic compressor (classic_compressor_v117.zip, 357 KB) by Kjaerhus Audio: a simple compressor that has everything a compressor must have. A threshold button, which defines the volume from which the compressor starts compressing, a ratio button going from 1:1 (no compression) to 'infinite' (at this level, the compressor becomes a limiter), a knee button to set whether the compression will start as soon as the threshold is reached or if it will act smoother, an attack button to define how fast the compression acts once the threshold is reached, a release button to define how long it takes for the compression to stop once the sounds goes down below the threshold level, and a level button to define how much gain you want to compensate for the loss of volume of the compression. The more you compress, the more the volume will be reduced, and you make up for it bu using the level button, and the final sound will seem louder than the sound without compression, even though the volume is the same. A limiter is another sort of compressor, with a slightly different purpose. It is still about boosting the sound signal, only this time, you are to limit the volume at a specified level. You can decide that an instrument will never exceed a given volume, whatever happens. This can also be applied to an entire song: you decide that the final sound level will not exceed a specified level. To do that, you have to define a threshold (minimum volume level) from which the sound will be boosted, and a maximum volume level. Like for compression, the lower the threshold, the more compressed the sound will be, and if the setting is wrong, the sound will become unpleasant to the ear. You then have to look for the settings that do the job without spoiling the sound. 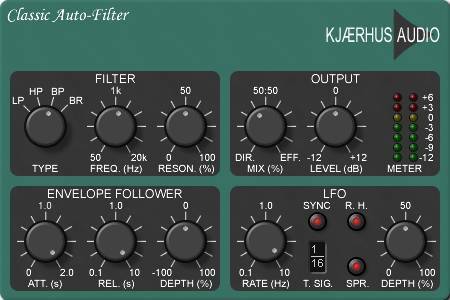 Classic master limiter (classic_master-limiter_v106.zip, 357 KB) by Kjaerhus Audio: A simple threshold button that defines the level from which the compression will start. As there is no ceiling button, you define the ceiling volume by setting the volume of the track where the limiter is placed. If you want a ceiling control, try the W1 plugin below. W1 Limiter (w1limiter.zip, 162 Ko) by George Yohng, without a graphic interface: it's a free clone of the retail L1 Ultramaximizer limiter from Waves. Very simple to use, you define a threshold, a ceiling and a release time. The zip file includes both 32 and 64-bit versions. There is a version with a graphic interface (shown below and available on this page), but it makes my DAW (Cakewalk Sonar) and my video editing software (Sony Vegas Pro) crash. So I uninstalled it and kept the very stable version without a graphic interface. Official website of the developer of this limiter: here. With a graphic interface, then without a graphic interface as it appears in Sony Vegas Pro 12, and in Sonar Producer. An equalizer (EQ), is a tool that is used for increasing or decreasing the sound level of specific wavebands. Basically, it is like a volume knob, but instead of altering the volume of a whole song, you may choose to only increase or decrease the volume of the frequencies you want. Take a hifi amplifier for instance: you have "bass", "medium" and "treble" knobs. That's a simple EQ, that allows you to adjust these parameters to your taste. Graphic EQs let you adjust fixed wavebands, while parametric EQs let you edit the frequencies of your choice, as well as their width. Parametric equalizers are therefore more acurate but also more difficult to use. Multiband parametric equalizer. You can add as many bands as you wish. I tried to find the limit, but stopped clicking on the "add" button when I reached 275 bands... I got bored of it! Needless to say that there is no use in having that many bands, but for those who find it convenient to have 10, 12 or even 20 bands, it is possible. This is a 7-band graphic EQ from Kjaerhus Audio. You can independently set the left and right channels, or link them. The frequency bands are 20 Hz, 63 Hz, 200 Hz, 630 Hz, 2 KHz, 6.3 KHz and 20 KHz. 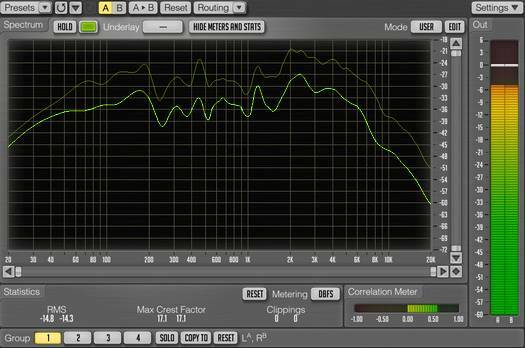 This is a very effective EQ, with clearly audible changes to the sound. You can set the frequency bands by steps of 1 dB, from -10 dB to +10 dB. Although it's rather old (it was made in 2005), it remains an excellent choice among free EQs, and can either be used for individual tracks or for the entire mix on a master bus. A reverberation, or reverb, is created when a sound is produced in an enclosed space causing a large number of echoes to build up and then slowly decay as the sound is absorbed by the walls and air. It is possible to reproduce spaces of various sizes which of course will sound differently. Reverberation in a cathedral does not sound similar to that obtained in a bathroom. A delay is similar to an echo. The sound will repeat at regular intervals and eventually fade out. With a delay, you can set the number of repetitions, the interval between two repetitions and the duration of the fading out. In general, you tie the repetitions to the tempo, on beat or offbeat. You can use the delay instead of a reverberation when you want to enrich the sound without filling up the mix, especially if the mix is already full. Roughly, the reverb will produce a continuous sound, whereas the delay will repeat at regular intervals and turn out to be less invasive. This excellent free reverb makes use of convolution. What is convolution? In the field of audio signal processing, convolution will simulate the reverberation of any actual or imaginary venue. It is based on the mathematical convolution operation and uses sound samples called impulses. You can use pre-recorded impulses (see below), or create your own. In SIR 1, you load the impulse of your choice and apply it to the track you wish in the DAW (guitar, bass, vocals, drums, piano...) to simulate your instrument playing in the chosen location. The reverb will be more or less convincing depending on the quality of the impulse, but it can give excellent results. You may of course use any sound file as an impulse, which can give surprising results. Experiment. Caution: do not use audio files that are too big, because the longer the file, the more computation will be complex and the processor load might be increasing dramatically. A chorus effect occurs when individual sounds with roughly the same timbre and nearly (but never exactly) the same pitch converge and are perceived as one. It creates a thicker and fuller sound. Flanging occurs when two identical signals are mixed together, but with one signal time-delayed by a small and gradually changing amount, usually smaller than 20 milliseconds. This produces a swept comb filter effect: peaks and notches are produced in the resultant frequency spectrum, related to each other in a linear harmonic series. Varying the time delay causes these to sweep up and down the frequency spectrum. 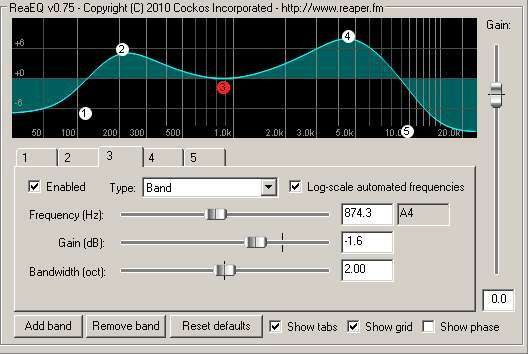 A phaser is an audio signal processing technique used to filter a signal by creating a series of peaks and troughs in the frequency spectrum. The position of the peaks and troughs is typically modulated so that they vary over time, creating a sweeping effect. For this purpose, phasers usually include a low frequency oscillator. Here are some VSTs that produce unusual effects, and also tools that may be convenient for you, such as a guitar tuner or a spectrum analyser. 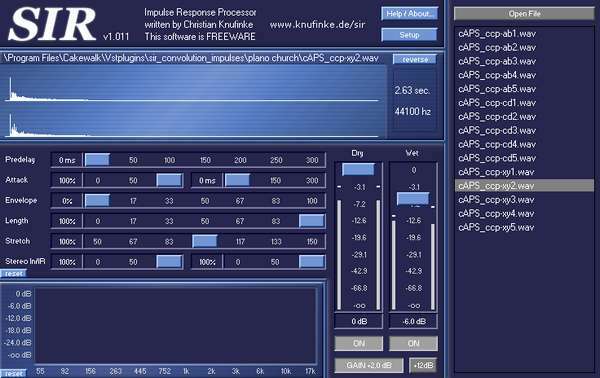 SPAN by Voxengo: A good, free spectrum analyser, to download directly from the developer's website.